Kenya is home to the Great Wildebeest Migration in the Masai Mara and it is the birthplace of the iconic 'African Safari' experience. Boasting open savanna plains, snow-capped mountains and desert terrain, it's a marvel in terms of biodiversity. You'll stay in luxury tented lodges with private viewing areas and the traditional Maasai people will teach you about the bush and their culture. Spot the Big 5, get to know communities and bear witness to what a true African sunset looks like. We've called this a sustainable tourism safari because all the lodges included are associated with the Long Run Initiative which fosters community development and biodiversity conservation (www.thelongrun.com). From US$10,655 in low season to US$12,765 in high season, per person sharing. This is subject to change depending on season and availability. Arrive at Nairobi, transfer to Wilson Airport for a scheduled flight to Kampi Ya Kanzi for 2 nights. A representative will meet you at Jomo Kenyatta International Airport and ensure you board the scheduled flight to Kampi Ya Kanzi. Mount Kilimanjaro serves as the backdrop for the specatacular Kampi Ya Kanzi, which lies on the slopes of the Chyulu Hills in the Amboseli. The camp lies in the heart of the Kuku Group Ranch, which is owned by 3000 Maasai. There are 8 ensuite luxury tented cottages, all raised under thatch. Part of this leg of the tour is the contribution of a USD 100 conservation fee per day, which goes into the Masaai conservation trust. Fly to Wilson Airport and connect to Saruni Samburu for 2 nights. After breakfast you will be transferred to the airstrip for your scheduled flight to Wilson Airport and then onto Samburu. Saruni Samburu is actually located 7km north of the reserve and is a luxury, designer lodge. 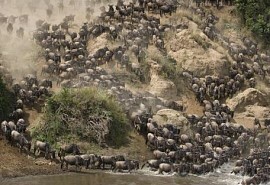 95 000 Hectares of private conservancy teeming with wildlife surrounds Saruni Samburu. There are 4 large rooms and a pool that overlooks a vast landscape, home to an array of wildlife. Guests can enjoy game drives in Samburu's own conservancy - Kalama. Saruni offers exclusive luxury and privacy. Game drives are led by professional Samburu guides. Day 5 begins with a road transfer to Segera Retreat where you will stay for 3 nights. After breakfast you will be transferred by road to Segera. Segera Retreat is located in an oasis on the Laikipia Plateau. 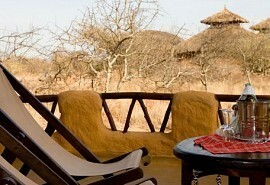 Accommodation is in the style of villas made from timber and thatch, nestled in landscaped gardens. Raised wooden platforms overlook the savannah and Mount Kenya. Guests can enjoy cuisine made from home-grown ingredients and a wealth of things to do, such as bush walks, game drives, cultural tours and spending time with anti-poaching staff learning about the methods used to conserve wildlife. Fly to Cottar’s 1920s Camp for 2 nights. After breakfast, you will be transferred to Nanyuki for your scheduled flight to the Masai Mara where you will enjoy a game drive on your way to the camp. 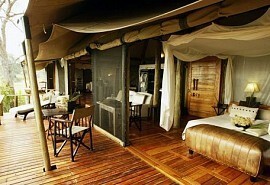 Cottar's 1920s Camp is located a stone's throw away from the Masai Mara National Reserve in an exclusive concession. 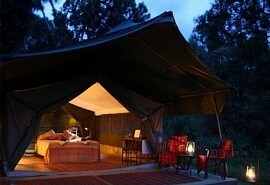 Boasting 7 ensuite exclusive safari tents, it's a sought after camp. Enjoy superb views from the veranda and soak up the luxurious atmosphere of the camp. Furnished with original safari antiques from the 1920s, the camp is a piece of history. Activities include day and night game drives, bush walks, a swimming pool, river swimming and fishing, bush meals, sundowners and massages. After breakfast you will be transferred to Keekorok Airstrip to connect with your daily scheduled flight to Wilson Airport. A representative will meet you here and transfer you to Jomo Kenyatta International Airport to connect with your international flight.